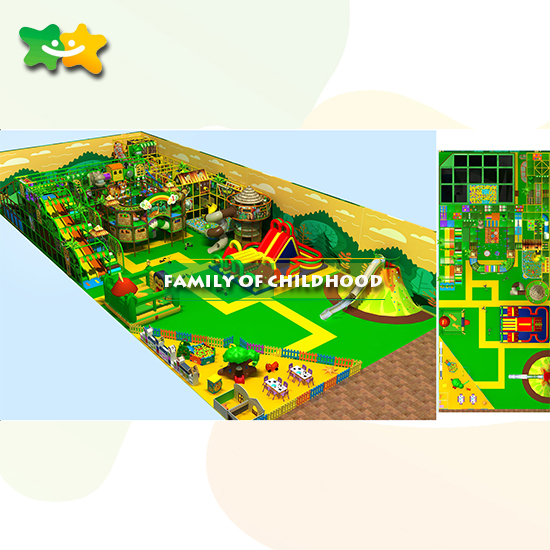 Family of childhood kid indoor playground and kids theme park. It is well known that kid indoor playground and kids theme park are some of the best selling product in the Family of childhood. The reason why they are so popular is that the quality of our kid indoor playground equipment is perfect. Many of our customers are big fans of our products, and they usually buy back. Kid indoor playground and kids theme park have been selling well in many countries. Such as Europe, North America, Middle East, Southeast Asia, and Africa, etc, which won high appreciation from customers. For example, in India, we made a big project for one of our customers, it including Children’s area, development area, physical area, gun area, soft roll area, rest area, electric area, theme area, a learning area and so on. Here is a video about it shot by Family of childhood. From the video and photos, we can see that the site is not large, but we make the good use of every single place. All the children can find their happy time in there. Let’s see another example, in Kazakhstan, we made the design for our customer. The site is over 2000 square meters, and we made use of it according to the customer requirements. Here are some will figures about the kid indoor playground. This is a wide slide for the infant. For kid indoor playground and kids theme park, we have many finished projects whatever local country or oversea city. If you are interested in our products, you can contact us, we have a video show you. Wish we can have the great work together! Please contact us to leave your contact information.We will design the right style according to your budget and venue.